Ely Cathedral Girls' Choir was founded in September 2006, under the direction of Louise Reid, former director of the Girls' Choirs in both Wakefield and Guildford Cathedrals. Since 2010, the choir has been directed by Sarah MacDonald, who is also Director of Music at Selwyn College, Cambridge. The 18 girls are members of King's Ely, in Years 9 to 13. They board in Etheldreda House, rehearsing five mornings a week before school. During school term, the girls sing Choral Evensong in the Cathedral on their own on Wednesdays, and with the Layclerks on Mondays. Weekend and additional Holy Day duties occur once or twice a month, and the girls also sing a number of concerts every year, both on their own, and with the men and boys of the cathedral choir. 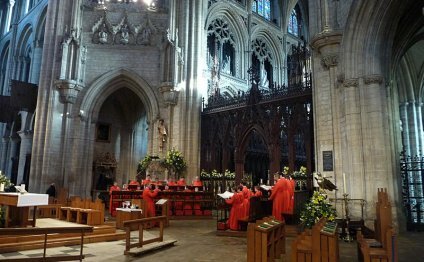 As well as cathedral services, the girls have sung concerts and services outside of Ely, including services in Westminster Abbey, Notre Dame de Paris, and a live broadcast on Radio 3. Sing reign of fair maid, a recording of Christmas music for upper voices under Sarah MacDonald's direction, is on the Regent label and is available for sale in the Cathedral shop or online. A recording of the Pergolesi 'Stabat mater and other music for Lent and Passiontide' is available for sale in the Cathedral shop or online. The girls are also featured on a CD of music by Gary Higginson, with the Choir of Selwyn College, Cambridge. Girl choristers receive bursaries of one-third off boarding fees. Sixth Form Choral Scholarships are also available to members of the girls' choir, and are valued at 50% off boarding fees. Additional means tested bursaries may be available. The school funds the girls' choral bursaries and all associated staffing costs so there is no drain on the cathedral's resources. Auditions are held in either January or February each year for entry into Year 9.